A commission for a client I got from this very website. Pretty fun piece, though not much to say about it since I don't follow the universe that much. Hope everyone likes it! Commissions are open, so if you like this piece and want something like it for yourself, drop me a line here by going to the "About" page and using the Contact Form! For more info about this universe, check out: http://althistory.wikia.com/wiki/1983:_Doomsday for the original universe and then http://www.alternatehistory.com/forum/threads/rise-of-the-north-a-canadian-isot-event.172044/ and http://www.alternatehistory.com/forum/threads/in-defense-of-humanity-canadian-power-meets-doomsday.176377/ for the timeline! As always, to view this image in its biggest size, right click and open the image in a new tab. 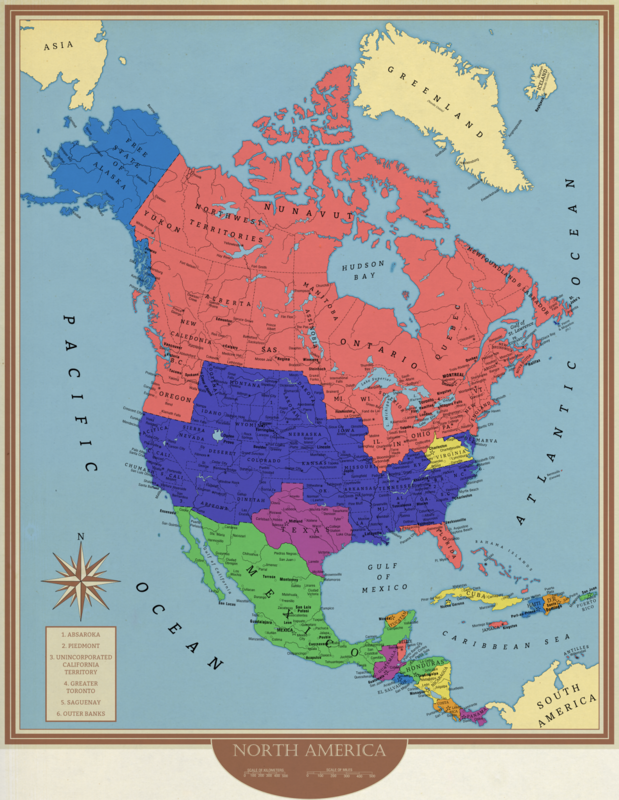 The universe of the map is actually based off the Rise of the North timeline at Alternate History. It's the Canada of an original timeline, Canadian Power, ASBed into the world of 1983: Doomsday. There's an associated TL, In Defense of Humanity, which took the timeline into the future. The creators are Ming777 (Rise of the North) and TheMann (Canadian Power and In Defense of Humanity). I requested the commission, based on the RotN universe as of March 2015. Oops, I updated it! Thanks for the info! It actually reminds me of the Jesusland map that was popular 10 years ago. Haha, I guess it does a little bit. I can't complain, though, I always love a big Canada!